Summary Broadcom-based AC1900 class router running a subset of Synology's NAS OS. Normally when I start a review with "Synology's latest product...", most SNB readers would assume I was going to review another NAS. 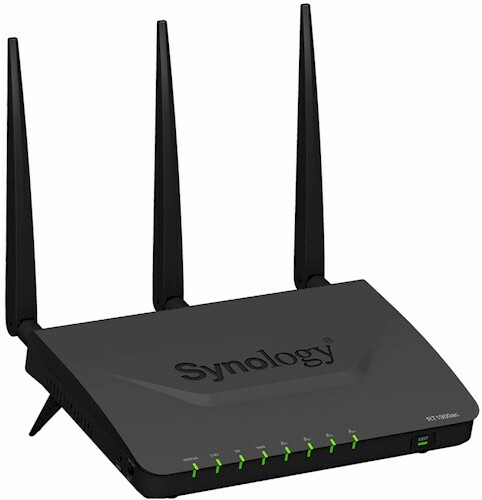 But this review focuses on Synology's first entry into the wireless router market, the RT1900ac Router. The RT1900ac was first introduced at Computex 2015 and has been available in many markets outside the US for at least six months. It's a very late entry to the already-crowded and very competitive AC1900 market in the US. The Router's key differentiator, and frankly the only reason to consider buying it, is its operating system. Synology Router Manager (SRM) is essentially Synology's DSM NAS OS, ported to a Broadcom SoC platform with routing and wireless features added. SRM has the look and feel of Synology's DSM NAS operating system and can be enhanced by installing add-on packages. Currently, there are five packages available, which we'll cover in the features portion of the review. The RT1900ac comes in a fairly generic black plastic case. The top case, with the exception of the Synology logo, has a black matte "vapor blast" finish which is resistant to fingerprints. The sides and bottom of the case have air ventilation slots to provide cooling. I noted that the RT1900ac tends to run a little hotter than some of the other routers I've looked at. On the top of the case, I measured temperatures ranging from slightly above room temperature up to 103°F. On the bottom panel, shooting the laser thermometer through the air vent slots, I measured temperatures ranging up to 113°F. Power consumption was measured at 12 W.
The RT1900ac ships with two feet screwed to the case bottom that elevate its back end as shown above. Also included is a larger bracket that slides into the wall-mount screw slots on the bottom cover to position the router upright at about a 60 degree angle. The image below shows the front and rear panel callouts. The front panel indicators (left to right) are power, 2.4 GHz, 5 GHz, WAN and LAN ports 1-4. The LAN ports are multi-color LEDs to indicate link speed. (green = 1 Gbps, yellow = 10/100 Mbps). On the right side of the front panel, there is a USB/SD eject button along with a status/activity indicator. The right side of the router has a USB 3.0 port and SD card slot. On the left side, there is a button for WPS and a switch to enable/disable Wi-Fi. The rear of the router has the usual complement of four Gigabit Ethernet LAN ports, Gigabit Ethernet WAN port, power button and power connector. The RT1900ac has removable "high gain" antennas using RP-SMA connectors. For the 2.4 GHz band, the gain is 3.5 dBi; for 5GHz, the gain is 4.6 dBi. Although the RT1900ac is Broadcom based, pairing a BCM58622 ARM cortex A9 processor with embedded Gigabit switch with two BCM43460 radios. Other popular Broadcom-based AC1900 class routers use either the BCM4708A or BCM4709A processors paired with BCM4360 radios. Of significant note is the 4 GB of flash found in the RT1900ac,compared to the 128 MB in most other AC1900 class routers. There are two versions of the board. US customers will most likely get the R1 version that recently appeared in the FCC ID database. The images below show the different board versions; version 1.3 for the original board and version 1.7 for R1. While they are very similar, the R1 board has shielding tape added. You'll also note the coaxial cables for the center and right antennas have been rerouted away from what appears to be the CPU in the center of the board. The R1 board also eliminates the tape on the two coaxial cables and instead, routes all cables through a single clip on the upper left side of the board. After testing was done, we opened the router and popped the tops of the RF cans to identify the other radio components. Here's a shot of the R1 board with the radio can tops off. When we took the big heatsink off that sits on all the RF cans, we found only two small thermal pads coupling the heatsink to the top of the processor and top of the 2.4 GHz radio. There were also no thermal pads on the inside of the RF can tops to thermally tie the BCM43460 radio SoCs to the can tops. The thermal design definitely could use some improvement. Table 1 below summarizes the key components of the RT1900ac as well as two other AC1900 class routers —one more expensive and one cheaper than the Synology router. The RT1900ac also has a Genesys GL836 USB 2.0 Interface Flash Card Reader controller.